Edraw is used as a swot matrix software coming with ready-made swot matrix templates that make it easy for anyone to create beautiful swot matrix. 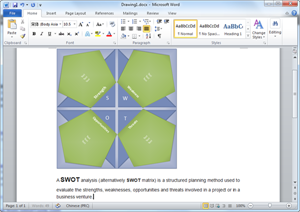 The swot matrix templates are easy to use and free. Edraw can also convert all these templates into PowerPoint, PDF or Word templates. 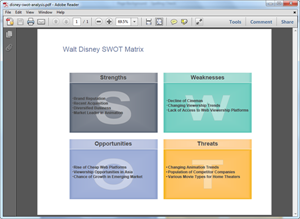 Creating a swot matrix in Edraw is easy. It only takes a few seconds to choose a basic template, insert text and images, and add the finishing touches. If you want to use a ready made template, go to swot matrix templates page and choose the SWOT Matrix that best matches your design. When you complete your swot matrix in Edraw, one click on the Export button will transfer your drawing into MS PowerPoint presentation. You need to consider few things when creating a swot matrix. 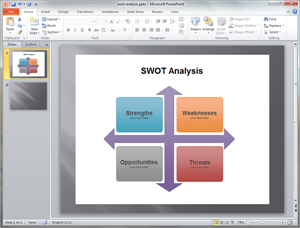 A single click on the Export PDF button will convert your swot matrix template into PDF. 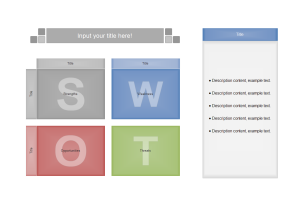 You can view the PDF SWOT Matrix Template to view the quality. When to Use SWOT Matrix? SWOT analysis is a simple framework for generating strategic alternatives from a situation analysis. It is the first stage of planning and helps marketers to focus on key issues. SWOT stands for strengths, weaknesses, opportunities, and threats. A SWOT analysis can be used to explore new solutions to problems; identify barriers that will limit objectives; decide on direction that will be most effective; reveal possibilities and limitations for change, and many other situations. Discover why Edraw is an excellent program to create swot matrix. Try Edraw FREE.